If you love Vegas as much as us, it makes sense that you would want to take any opportunity to make the trip. Or so I thought. I knew that Christmas was one of the busiest times of the year in Las Vegas, but I wasn’t quite prepared for the amount of people and the way certain places and activities were crazy-busy while other spots were ghost towns. 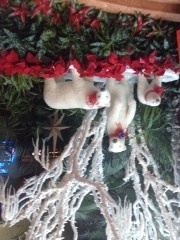 Luckily the weather was on our side, so no complaints there this time around, but read on for my overall assessment of spending Christmas in Vegas and what you should know if you are considering making a future trip during the holidays. There are a lot of families with children! I’m hoping someone can explain why people bring little kids to Las Vegas, especially at Christmas, so if you know, drop us a comment. Don’t kids want to be at home with their own tree and a fireplace for Santa? I know not everyone celebrates Christmas, but why try to brave the strip during such a busy time? If you have been knocked over by one too many strollers, check out the Wynn and the Encore. They don’t allow strollers, so at least you can’t get run down. Beware that the 24 hour party cycle seems to extend to kids – there were really little ones running around even after midnight. 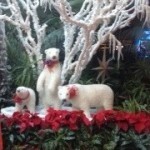 Especially at the Palms, which I thought was generally less kid-friendly. The distribution of people and what is/isn’t open is beyond strange. While there were a ton of people just milling about the casinos and free attractions like the conservatory at Bellagio, there was hardly anyone in the clubs. It made walking around a pain, but left a lot to be desired when it came to nightlife. Be flexible when it comes to where you dine as not every restaurant will have the same crowd issues. For instance, when P.F. Chang’s had a 90 minute wait (don’t ask why we tried to dine there), the Brazilian steak restaurant at the same hotel (Planet Hollywood) sat our party of six right away. We also walked by a number of empty-ish restaurants on the restaurant row between the Venetian and the Palazzo, but we couldn’t get service at C arnevino even after we had a reservation because our waiter was so busy (more on that later). Know that if you are given a long waiting time, that might not extend to other nearby spots. Try something off the main core if you need a break from the crowds. 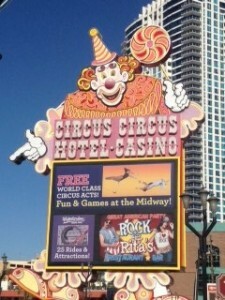 We were so overwhelmed, we actually walked to Circus Circus and the Riviera just to get some breathing room. It was interesting to see the juxtaposition of the older partof the strip with the excess of the current big hotels, but the people were really nice, and everything was so much more affordable. Sure, there wasn’t shopping or the high-profile restaurants, but with everyone trying to take advantage of the holiday sales, the shops weren’t worth the hassle anyway. I don’t think those older haunts are long for this world, so check them out while you still can. Despite the giant crowds that persisted through much of the trip, but not where it counted, it was a fun time. I saw the Phantom of the Opera at the Venetian for the second time, we watched the very enjoyable Vegas! The Show and had a few good meals. While any time is fun in Vegas, I wouldn’t recommend the holidays as a good time to go. Wait until the new year so that the crowds are a more consistently distributed and you have more options on where to eat, shop and stay. While many places were decorated for the holiday, it definitely didn’t feel like the holidays, so if you love that Christmas/Chanukah feeling, the type of magic Vegas is known for isn’t going to help you recreate it.